Giles County is nestled in the mountains of southwestern Virginia nudged up against the West Virginia border. It is a place of rolling vistas, meadows, dappled creeks, and waterfalls; the ancient New River runs through the very heart of the county. In addition to a county seat with a population of 2,700, there are a number of small towns, some of them too small to even boast a mayor or lay a sidewalk. There is a strong and proud Appalachian tradition in Giles, great storytellers, wonderful musicians, and a tenacious sense of community. There are also isolated hollows of misery, 47 percent of county citizens live in poverty. Some of the children emerging from the darkest of those hollows arrive for a first day of school never having touched a book, or sat in a chair; they have no idea of how to hold a fork or take-a-turn. They are left behind before they even begin. The Giles Early Education Project (GEEP) formed in early 2012 with the conviction that the best way to lighten the dark places in the county was to begin with its very youngest citizens. GEEP is a small but determined group of very hardworking idealists (including Ann). In the past five years they have advocated for early childhood with the county board of supervisors and have seen the establishment of five pre-schools within the public school system; GEEP has put books into hundreds of small hands and opened three “little libraries” within distressed communities. The group also runs an arts program each summer concurrent with the county’s Free Lunch Program; they have sponsored early childhood teacher trainings and small children’s festivals. Through working with other agencies, and with help from a private contribution, GEEP has given every at-risk new mother a book on childcare and a beautiful board book for her newborn. 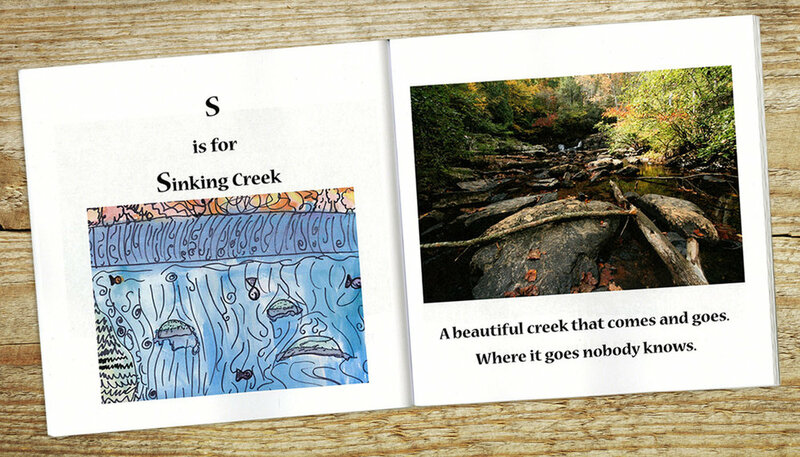 Early this spring GEEP wrote and produced Smiles of Giles – A County Alphabet Book. Smiles of Giles was created as a literacy project, but also as a way to give the children of the county a sense of place and community. Giles County Administration and a philanthropic couple pitched in the funds to make it possible for every three, four and five-year-old enrolled in any of the county’s early child centers to own a copy of the alphabet book. “We have a waterfall!” a four-year-old exclaimed as she pointed to C is for Cascade Falls. The small book is illustrated with drawings by the children from the summer arts programs and with fabulous nature photographs by the county’s gifted official photographer. You can order a copy here. All the proceeds go to early childhood projects, bringing brighter smiles to Giles County.